By Chris Williams: Trainer Abel Sanchez says Amir Khan could have a chance of beating Terence Crawford if he can take him into the later rounds of their fight on April 20 at Madison Square Garden in New York. Sanchez still sees Crawford (34-0, 25 KOs) as getting his hand raised at the end of the fight, as he feels that he could be the best welterweight in the division right now at this moment. Like a lot of people, Sanchez is sold on Crawford from watching him beat guys like 5’5″ Felix Diaz, Viktor Postol, Ricky Burns, Jose Benavidez and Jeff Horn. However, Crawford still hasn’t beaten any of the super talented fighters at 140 and 147. He beat a lot of guys that weren’t proven. Sanchez feels that the 31-year-old Crawford and IBF welterweight champion Errol Spence Jr. are virtually tied in the best fighters at 147. But he expects Spence to pull ahead of Crawford in two or three fights after he picks up more experience. “Terence is an exceptional fighter. Terence is, if not #1, he’s #1 1/2,” Abel Sanchez said to Behind The Gloves. “He’s very, very good, but so is Amir. He’s got quick hands. His [Khan] betrayed him in a couple of fights. His chin betrayed him in his last fight against a bigger guy. He’s fighting a 140 pounder [Crawford]. If the fight goes on [into the later rounds], he’s going to give Terence some issues, but Terence will win the fight,” Sanchez said. It’s expected that Crawford will beat Khan without any problems. That’s why Khan was picked by Crawford’s promoters at Top Rank Boxing. If they wanted Crawford to lose, they would have thrown a ton of money at Spence or had him move up to 154 to take on someone that would likely run him over like a truck like Jarrett Hurd. It’s understandable why Khan has been picked for Crawford. However, a win over Khan isn’t going to have the desired effect of turning Crawford into a star in the United States. It might make Crawford a little more popular in England and the rest of the UK, but it will have neglifible effects on the Nebraska native’s popularity in the U.S. For Crawford to become popular in the States, he needs to beat someone like Spence, Keith Thurman, Hurd, Jermell Charlo, Manny Pacquiao, Saul Canelo Alvarez, Erislandy Lara, Gennady Golovkin or Daniel Jacobs. Most of those guys are out of reach for Top Rank. Canelo, GGG, and Pacquiao would likely never agree to fight Crawford, even if they were offered a lot of money. “He may be tied with Errol Spence,” Sanchez said giving his opinion that he sees Crawford and Spence close to the same level right now in the talent department. “Spence and Crawford are the cream of the crop at welterweight. Right now, I think I’d give it to Terence [to beat Spence] only because of the experience, and if he beats Khan, who has experience in big fights. But he [Crawford] won’t beat Spence in two or three fights, because Spence will have that experience. He’s going to have to fight the better guys at that level. He [Spence] has a 12 round fight with Mikey. If he wins that, he’ll learn the most about being a professional fighter. Mikey will help him with that. That’s a difficult fight. Spence is a big man. Mikey is an exceptional fighter, but Spence is a big, big man. If Mikey can withstand the strength and the size of Spence, then I think that’s a close decision for one of the two,” Sanchez said. Mikey isn’t going to much as far as teaching Spence about to fight as a pro. Spence is the more experienced guy from his amateur days in the Olympics. Whatever Mikey can teach Spence is stuff is minimal. Sanchez is underestimating how much Spence knows as a fighter. If the Spence vs. Garcia fight goes to a decision, it won’t likely be a close one unless the scoring by the judges is off the charts bad. Spence is likely going to knock Mikey down three or four times in the fight. If the judges can’t get the decision right with that many knockdowns in the fight, then there’s not much you can do. Crawford might not be at the same level as Spence or even close to that. Crawford’s last fight against Jose Benavidez showed that he might not be even at the level of Shawn Porter. 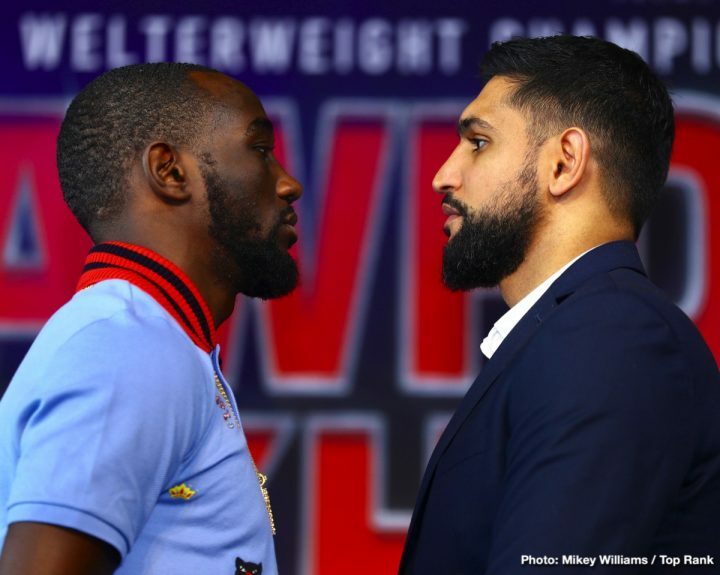 The unfortunate part about it is the boxing public may never see how good – or not so good – Crawford is, because his fight with Khan might be as good as it gets when it comes to him fighting notable opposition at 147. Guys like Spence, Keith Thurman, Pacquiao, Porter and Danny Garcia are with Al Haymon at Premier Boxing Champions, so they’re not likely going to cross the pond to fight Crawford on ESPN. Their fights are on FOX and SHOWTIME. It’s nice to speculate though about whether Crawford is as good as Spence, Thurman, Porter and Garcia, but there’s no way of knowing and we may never now. 11 years of Crawford’s career has flown by without him fighting any of the notable 140 and 147 lb fighters, and it’s to imagine another 11 years will go by without him fighting anyone of note. Crawford won’t be able to prove that he’s at the same level as Spence if he’s going to be fighting those type of guys for the next three to four years.